Solaris is Camphill Hudson’s Center for the Social Arts, and it is the first Center of its kind. Located right in the middle of Hudson’s downtown, just two short blocks from the Camphill Hudson homes, Solaris is a place in which people of all ages and abilities can find that they have a meaningful contribution to make to their world. Solaris was founded in October 2012. “We are thrilled to be part of this new collaboration, and grateful that (Solaris) has opened its doors to us and provided such an ideal space to work. The gourmet kitchen is beautiful, and the adjoining room perfect for craft work." 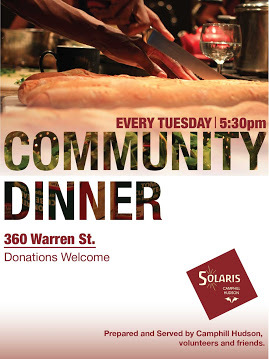 Tuesdays are Community Dinner nights at Solaris. In October, 2012, Camphill Hudson began hosting Community Dinners, and we now serve between 50 and 70 people weekly. Dinners are cooked and served by members and volunteers of Camphill Hudson and Triform Camphill., The meals often include fresh bio-dynamic produce from Triform's gardens. Some who come to the meal have mental health issues, developmental disabilities, or are homeless or otherwise in need. Some are local restaurant or shop owners, musicians, artists, employees at local businesses, or friends from area churches. All are treated with dignity, and all sit together, family style, at tables laid with ironed tablecloths and seasonal centerpieces. One guest, who regularly eats at the Salvation Army, told his friends at the soup kitchen, "You've got to go to dinner at Camphill on Tuesdays. It's like eating at the Four Seasons!" Hudson residents have responded to the opening of our doors by asking us how they can help. Solaris provides a platform for Hudson residents of all abilities to get involved in their community and be of service. Local residents come to Solaris each week to: cook for Habitat for Humanity builds: assist with cooking community dinners: and to help us with our craft and theater work. Local businesses have also found what they can offer, whether it is off-cuts of paper from the local printer for a craft project, or perishable food from a local grocer for community dinners. Everyone finds they have something to give. Camphill Hudson works to build community with local organizations through working together on meaningful projects and socializing. Recently we partnered with the Hawthorne Valley Farm Learning Center and the Blue Hawk Nation (the Hudson City School District after-school program) to provide after school programming for HCSD students at Solaris. Each week, students from the M.C. Smith Intermediate School are bused to Solaris, where they participate in healthy farm-to-table cooking classes, combined with functional table crafts. At the end of each session, a Final Feast is held, with family members invited to partake in the fruits of the students’ labors. The tables are set with the crafts, such as hand-woven placemats and clay candleholders that the participants have created throughout the session. Hawthorne Valley Farm’s Learning Center leads the program, and residents of the Camphill Hudson house are volunteering to work with the students, who are enthusiastic and eager to learn. Solaris serves as the hall for Camphill Hudson and many cultural events and festival celebrations take place there that are open not only to Camphill Hudson residents, but to the community at large as well. Walking the Dog Theater regularly performs in the intimate theater on Solaris’ top floor, and Camphill Hudson hosts its festival celebrations (such as Christmas, Michaelmas, and Easter) at Solaris. Talks and other community events are also regularly hosted at Solaris.